I often employ photoshop to create things I wished existed in real life. What little girl wouldn’t want to play with a doll that came with a sword? Warrior Barbie comes equipped with a set of chainmail, a helmet that will mess up her hair but keep her brains from spattering across the field, and non-high heeled leather boots. She’s also equipped with a long sword, a short sword, and a shield. Rogue Barbie is here to poison and trap your enemies. She comes complete with a bow and a quiver full of arrows, or a set of daggers should she feel the need to get up close and personal with her victims. The always-glamorous Mage Barbie will look her best in an ivory bodice and leggings complete with matching floor-length cape. Not that any of that matters as she roasts the flesh of those who would dare oppose her with deadly spells and the occasional errant match. She comes with her own mage’s staff, a spell book, and a bottle for, well, I don’t think you really want to know what. Meet Necromancer Barbie! With her army of raised dead, she’ll be unstoppable against her enemies. She comes with a dagger, a vial of blood, and her first skeleton minion to aid in the ritual sacrifices necessary to conquer the grave itself. Paladin Barbie shall crush the unbelievers beneath her armored boot. Her armor is plate with an ivy motif, and her helmet will protect her from head shots as well as provide a nice disguise at any dull Skipper parties. She comes with a gold shield and sword as well as a scroll that none can read but her. Ranger Barbie will have none of that loud clanking metal; she moves with quickness and silence, sniping from the canopy of her home in the trees – a bit like a monkey with a deadly weapon. She comes with a hunting knife, her own woodland friend (whom she can also hunt and kill, if one is so inclined), and a small bottle of calamine lotion. Poison Ivy is a harsh mistress to us all. He doesn’t really wear any clothes – not that he has any. In fact, it’s hard to get much out of Barbarian Ken aside from the occasional grunt and fart. He’s certainly not the perfect boyfriend, but he might be good for a roll or two if you can get him to take a bath. Comes with a giant sword that is in no way overcompensating for something, a tankard, and the severed head of Blaine. ​ S.E. 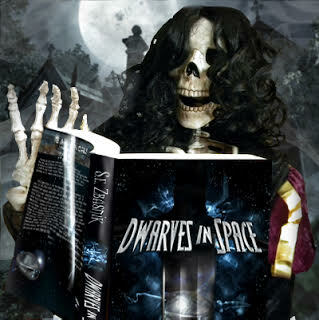 Zbasnik is the author of the Dwarves in Space series – think Tolkien and Hitchhiker’s merged in a horrific transporter accident – as well as a bunch of other fantasy novels. You can find her on Twitter as well as Facebook, and hopefully not standing right behind you. She’s actually made both a Cthulhu and Commander Shepard Barbie for real.